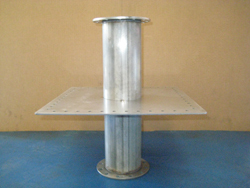 Our quench vent can be built to match manufacturers’ specs. If you want quality work performed by certified welders, you have come to the right site. With over 40 years in the industry, our quench vent is expertly designed and can be shipped quickly in emergency situations. We design and fabricate custom quench vent systems at our manufacturing facility in Largo, Florida. We can ship quench vents to any site, anywhere in the world. Each MRI manufacturer has individual specifications that must be adhered to in the design of quench vent systems for their MRI. Ernie's Welding ensures that all helium exhaust pipe systems meet these stringent specifications. On all of the systems we provide, we apply the specifications supplied to us by the contractor, manufacturer, and engineering company of the equipment being installed. Our quench vent division knows the value of a job well done, and we will get your system built and shipped quickly! Call us now to inquire about getting a new system for your facility. Our design service uses computer numeric controlled machinery to create custom made parts. This ensures precision, and why the output of our quench vent are always of the highest quality. Our standard turnaround time to fabricate a unit is two days, plus shipping time, depending on the location. We can even ship your quench vent outside of the US if need be. If you are looking for high end, custom, durable parts for your MRI quench vent system, give us a call. We use mill-finished aluminum and stainless steel tubing along with sweep 90s and 45s. Custom segmented 90s and 45s can also be built to fit areas where height and space are issues. Our stellar customer service is why our customers place their trust in us to get the job done right. We have been in the business longer than any other company, and have well-established relationships with the big vendors for MRI machines. If you are installing a new MRI system, let’s talk! We build and ship quench vent. Ernies Welding and Fabricating Inc.
8080 Ulmerton Road #FLargo, FL 33771Phone: (888) 394-2754Email: christyne@quenchline.comCopyright © 2019 - All Rights Reserved.